Updating the SAP BusinessObjects BI Platform might well appear to be complex, however, there’s a few simple rules that you need to follow to ensure success. All server software must be applied before client software. This is particularly important when both server and client software is on the same machine. As soon as you update the client software, without first updating the server software, your server software will stop working! If you have the client software installed on the server, then you must update both. You’ can’t just update the server without then updating the client. Watch out for the next rule too! Before applying any Patch, you must ensure that both your Server and Client software is on the same Support Pack level. 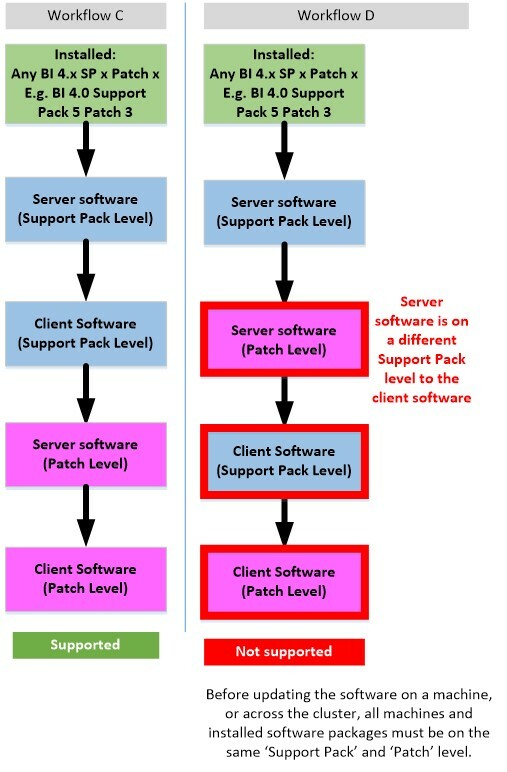 This applies to all servers within a cluster, i.e all servers must be on the same Support Pack level before the patch is applied to any one server. If you don’t you’ll have a corrupted installation. the Patch for the BI Platform Server Support Pack. But I strongly advise doing it AFTER you’ve updated the BI Platform Server Support Pack to avoid incompatibility issues. The Add-on Support Pack and Patch software are bundled into the same installer package. This means you can update directly to the required Support Pack and Patch level in one go, without the need to apply the Support Pack first, then the Patch. Not all versions of all add-ons are compatible with all versions of the BI Platform. However, if you update to the latest BI Platform Server Support Pack level and the latest BI Platform Server add-on level, then you’ll typically be just fine. It’s always advisable to double-check this point by looking at the Product Availability Matrix for the Product in question. You’ll find a page that lists which Add-on versions are compatible with which BI Platform Versions. Lets expand this subject a little. Lets say you’re on an old version of the product, BI 4.1 Support Pack 5 and you’re using some add-on which is equally quite old. Lets say that’s the Lumira add-on version 1.27. This combination (BI 4.1 SP5 and Lumira add-on 1.27 is supported as per the PAM). Lets say you want to update to a more recent version of the BI Platform, lets says that’s BI 4.2 Support Pack 3. But the Lumira add-on (1.27) isn’t supported on BI 4.2 SP3, so does this mean you need to go ‘via’ some Support Pack first or go ‘via’ some add-on? No is the answer. You apply the Support Pack first (BI 4.2 SP3), THEN apply the add-on update (1.31 being the latest). At the intermediate stage you’ll have BI 4.2 SP3 installed with an old (unsupported) version of the add-on (1.27), but this is ok since you’re not going to be using the software, you’ll going to update it almost immediately. 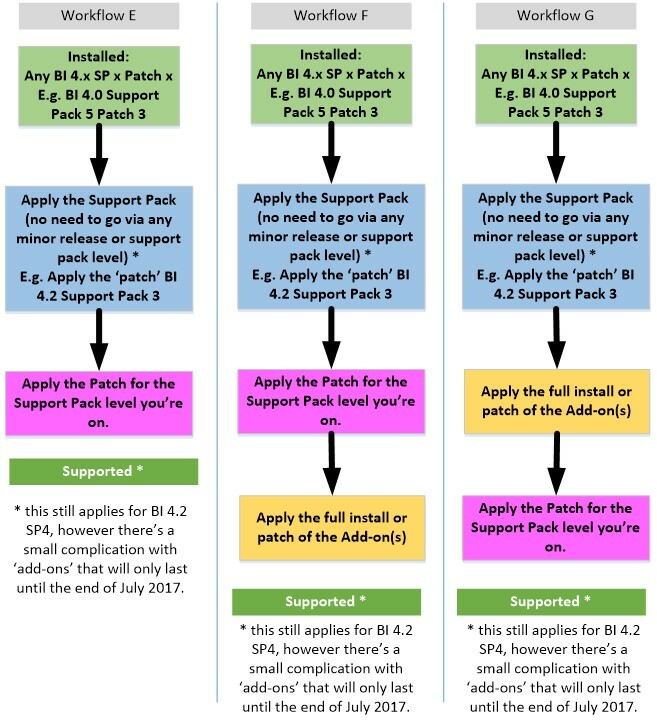 However, there’s a complication with BI 4.2 Support Pack 4. Some aspects of these complications, or gotchas will only last until then of July 2017 (once a new set of add-ons are released) and that’s explained next. If this is the case, then you’ll need to install the Design Studio 1.x or Lumira 1.x BI Platform Server add-on(s) BEFORE installing the latest Lumira 2 add-on. This blog as more. Because we’ve improved our software, we have two ‘gotchas’ regarding BI 4.2 Support Pack 4 when in comes to updating. The installer program in the existing add-ons (that where released prior to BI 4.2 SP4) can’t be used with BI 4.2 SP4 or later. So, you either need to update your add-on before applying BI 4.2 SP4, or wait until the next release of your add-on. The KBA 2467541 provides the official status. This gotcha is limited in time to the next release of these add-ons. This isn’t a general rule that will last very long. A bit more about that: If you’re updating your Platform to the latest version, currently BI 4.2 SP4, you’ll almost certainly going to update your add-ons to the latest version too. You’ll going to apply the Support Pack first, then the add-on. Once all the latest versions of the add-ons (that are supported with BI 4.2 SP4) are available this issue goes away. Until then, we have a ‘gotcha’. You may recall my advice just earlier about applying the Add-on AFTER applying the Support Pack. Well this is a case when you must apply the Add-on before the Support Pack. But before you do, please double-check with the Product Availability Matrix that your ‘new’ add-on is supported with your ‘old’ Support Pack. If it’s not compatible, you’ll need to update to BI Platform Server Support Pack level before you apply your ‘new’ add-on version. With BI 4.2 Support Pack 4 the ‘crypto’ libraries where enhanced. The effect of this is captured in SAP Note 2433337 and SAP Note 2475569 and also a blog. What does this mean from an ‘update’ perspective? This part of gotcha 2 is also limited in time, since you’ll probably update you server add-ons to the latest release (the ones that won’t have this issue). Communication over SSL using Upgrade Management Tool or Promotion Management is problematic when one system is ‘less than’ BI 4.2 Support Pack 4 and other is ‘greater than or equal’ to BI 4.2 Support Pack 4. 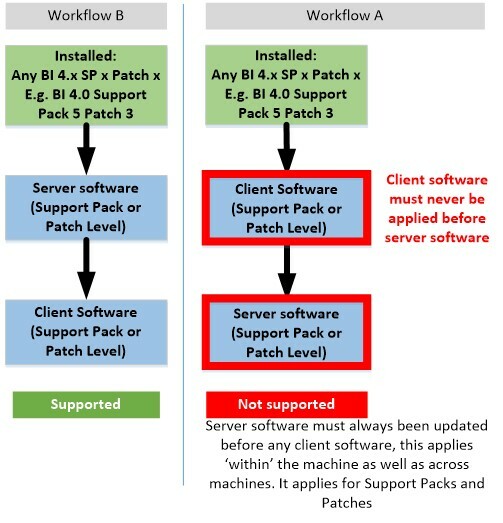 Any client ‘less than’ BI 4.2 Support Pack 4 connecting to a server ‘greater than or equal’ to BI 4.2 Support Pack 4 will not work. This isn’t supported, but many organisations update the server first (rule 1 above) and the later update the clients. So for a short period of time, the clients are one (or two) Support Pack versions lower than the server. Whilst not supported, with BI 4.2 SP4 this really won’t work meaning all server and all clients must be updated to the same version in one go. No gradual update for clients. (Possible workaround to this restriction). Once you’re on BI 4.2 SP4 then future updates, to say BI 4.2 SP5, it should work again, but unsupported as usual! The two gotchas together can be more confusing, so I’ve built this diagram to show various workflows of what is supported and what is not and how you navigate your way around. I’ve tried my best to make it as clear as I can, but please take your time to digest the diagram and the various workflows. Lumira 2.0 EAC SP0 and SP1 and Lumira 2.0 SP2 (The Open Beta release – NOT the GA release). These releases are NOT supported with BI 4.2 SP4. Updating to Lumira 2.0 SP2 (GA) from these version has known issues, please KBA 2521113.Lumira 2.0 SP2 (GA) is NOT an existing add-on. It’s a new add-on. Please see next section. Lumira 1.31.6 or greater – compatible with these BI Platform version and greater: BI 4.1 SP6 and BI 4.2 SP2. Lumira 2.0 SP2 (the Generally Available release) or greater – compatible with these BI Platform versions and greater: BI4.1 SP8 Patch 9, BI 4.1 SP9 Patch 4, BI 4.2 SP2 Patch 11, BI 4.2 SP3 Patch 7 and BI 4.2 SP4 Patch 1. It might seem a little odd, but these ‘new’ add-ons work with BI 4.2 SP4 and also with the old Support Packs too (well as long as the Product Availability Matrix for the product says so). Diagram Workflow L.
The installer for these Add-ons isn’t affected by the change of the installer in BI 4.2 SP4 because the installer isn’t tightly integrated into the Platform. So the old installers, for these Add-ons, work with everything BI 4.2 SP4 beyond and everything before too! Gotcha 2 still applies. Live Office isn’t a BI Platform add-on and so isn’t affected by Gotcha 1, Gotcha 2 still applies. The Early Adopter Care (EAC) provides selected customers with Lumira 2.0 SP0 and Lumira 2.0 SP1. If you have previously installed Lumira 2.0 SP1 there are known issues for updating to either Lumira 2.0 SP2 or BI 4.2 SP4. Please KBA 2521113. The Generally Available version of Lumira 2.0 is Lumira 2.0 SP2 (GA). The Lumira 2.0 SP0, SP1 and Lumira 2.0 SP2 Beta are NOT supported with BI 4.2 Support Pack 4. So you should not try to use BI 4.2 Support Pack 4 with anything before Lumira 2.0 SP2 (GA) . It will NOT work. Somewhat confusingly, the open Beta may be referred to as Lumira 2.0 SP2 Beta and you might well think this is Lumira 2.0 SP2 Generally Available version. It isn’t! 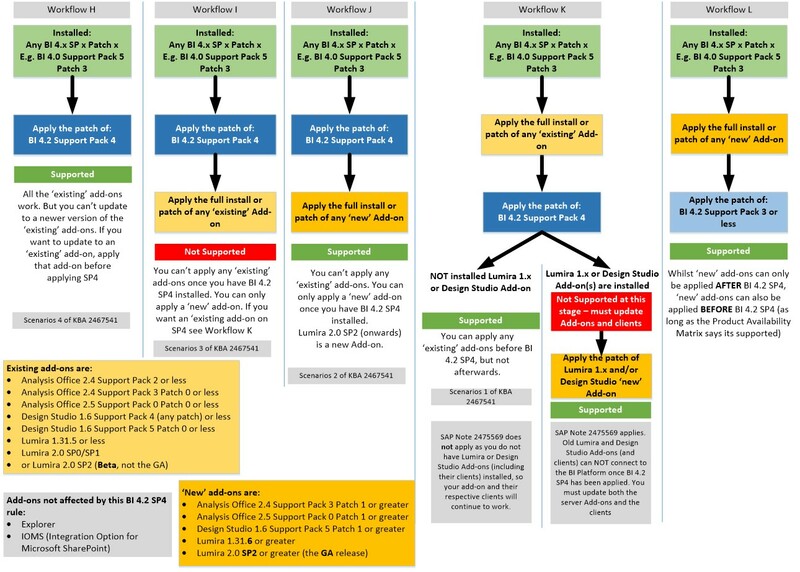 The Lumira Open Beta/EAC can only be applied BEFORE BI 4.2 SP4 and NOT afterwards. However the Lumira 2.0 SP2 Generally Available version can be applied both before and after BI 4.2 SP4. I hope this helps remove any confusion. Comments welcome of course. I’ll do my best to reply. If you do post a comment, please refer to the workflow by the appropriate letter A, B, C etc. Thanks for sharing this Matt. Look like we may need to do a initial analysis from supportability perspective before upgrading. Great information, thanks Matthew. Is there any predicted impact on Live Office, please? I’m trying to reconcile a couple of things here in this excellent breakdown of things. Is the version currently available for download to EAC participants consider “open beta” or is it considered a version in which we can apply our updates to any add-ons (including Lumira 2.0) we have for BIP 4.2 SP SP03 and then proceed with SP04. I ask because we are about to roll back the install of the Beta release of Lumira 2.0 we had installed prior to the EAC program opening up and then apply the currently available early release. So we would be on something between an earlier beta version and the general release coming up in July. We do have these questions out to the customer’s coach as well, but with Sapphire under way this week, I’m looking for answers wherever I can find them. PS – SP04 is kind of a big deal for them with the “fiorfied” Launchpad but their current projects need to proceed on their timeline. Otherwise I’d be telling them to wait until the end of July when things will be in more parity. I do understand this is confusing. Let me see if I can make a few things clearer. Only the GA release of Lumira 2.0 will be supported with BI 4.2 Support Pack 4. This means any Beta, the open Beta, or the EAC participants will be using a version of Lumira 2.0 Beta that is not supported with BI 4.2 SP4 and it will NOT work. Lumira Desktop will NOT be able to connect to the BI Platform. The KBA mentioned above refers to Lumira 2.0 SP2 as something that can be installed on top of BI 4.2 SP4. But the KBA reference to Lumira 2.0 SP2 is talking about the GA (Generally Available) release and NOT any Beta version of Lumira 2.0. It’s technically not possible to install Lumira 2.0 Beta (of any beta version, EAC or Open beta) once BI 4.2 SP4 is installed. Technically speaking though, once you have installed the Lumira 2.0 Beta (of any beta version, EAC or Open beta) on BI 4.2 SP3 you COULD update to BI 4.2 Support Pack 4. However you’re then not supported. The Lumira Beta (of any beta version, EAC or Open beta) isn’t supported with BI 4.2 Support Pack 4.
you can not uninstall it, well you can, but it won’t be a complete uninstall. you can update Lumira 2.0 SP0 to Lumira 2.0 SP1, but we recommend you uninstall Lumira 2.0 SP0 and do a full install of Lumira 2.0 SP1. When the Lumira 2.0 SP2 (Generally Available) release is available, you’ll then be able to update your BI Platform to BI 4.2 SP4 (as I just mentioned). You can also install a new server directly to BI 4.2 SP4 and install the Lumira 2.0 SP2 (Generally Available) version on top. Lumira 2.0 SP2 (Generally Available) version will require a new license key, unlike the Lumira 2.0 Beta (of any beta version, EAC or Open beta) that can use an existing Lumira 1.x key. The intension of this blog post was to talk about the basic best practices for successful BI 4.x updates but also to explain this complication with BI 4.2 SP4. I can’t stress enough, this complication with BI 4.2 SP4 will completely disappear by end of July (and assuming you want to update to the latest add-on version(s)). For those on Twitter I am @MattShaw_on_BI if you more questions! I’ve just updated my blog to reflect that using BI 4.2 SP4 and any Beta Version of Lumira 2.0 will not work. Please do not use, or try to use, Lumira 2.0 beta with BI 4.2 SP4. It will not work. Thanks for the quick response Matt and very much appreciated. We’re looking at a bigger picture and what you have shared makes perfect sense. The one other factor we are wondering about is that if we applied SP4 on top of Lumira 2.0 Server for BIP that we will still be ok with the non-Lumira aspects of BI Platform. We completely understand that the Lumira part of things would be in an unsupported state until SP02 is applied and could live with that for now on the environment on question. We’re just doing our due diligence to make sure we wouldn’t be putting non-Lumira parts of BI Platform at risk. Also understood RE: Lumira 2.0 SP01; we are removing the early Beta and moving to this regardless of what we may or may not do relative to 4.2 SP04. I’ve held back on replying because we’ve since identified a few issues with the ‘old’ Lumira desktop connecting to BI 4.2 SP4. Turns out, that the Lumira 2.0 Beta has the same problem of not working on BI 4.2 SP4 and for the same reason as Lumira 1.x. More will be published soon on that. But basically you’re right Chris. Once you apply Lumira 2.0 beta to BI 4.2 SP4 and then update to Lumira 2.0 GA you should be just fine. But given that Lumira 2.0 Beta simply doesn’t technically work with BI 4.2 SP4 (at least the desktop part won’t login) there’s really no point in either applying BI 4.2 SP4 ‘OR’ Lumira 2.0 beta. It’s one or the other for the time being. Once again, thank you for all the information you are providing. Some of us are hoping to get even more details about this if possible, especifically for Architectural decisions with medium-term impact for BI Platform and Dashboard capability. Assume one follows Workflow K in your diagrams, and installs Design Studio Add On 1.6 (“existing add-on”), then ugprades to BI4.2SP4. a. can this same system be directly upgraded to Lumira 2.0 (or does it require uninstalling Design Studio 1.6, then installing Lumira 2.0). What would be the supported approach? b. are there plans for new SP/FP releases for Design Studio Add-on for BI (I understand this may be someone else’s area, but it is so relevant for Businesses making decisions regarding dashboards that I needed to ask)? If so, I assume Workflow K means these new updates would not be compatible with BI4.2SP4+ (or would they follow the new installation technology?)? Question a: can this same system be directly upgraded to Lumira 2.0 (or does it require uninstalling Design Studio 1.6, then installing Lumira 2.0). What would be the supported approach? [update 12/June/2017 * ] we are not recommending an uninstallation of either Design Studio or Lumira. We are now only recommending updating to Lumira 2. Question b: are there plans for new SP/FP releases for Design Studio Add-on for BI (I understand this may be someone else’s area, but it is so relevant for Businesses making decisions regarding dashboards that I needed to ask)? If so, I assume Workflow K means these new updates would not be compatible with BI4.2SP4+ (or would they follow the new installation technology?)? Both Lumira Discover and Lumira Designer create Lumira documents, both can be opened in either tool (but with restrictions depending upon the workflow). Your question If so, I assume Workflow K means these new updates would not be compatible with BI4.2SP4+ (or would they follow the new installation technology?)? No. Design Studio 1.x add-ons will still be shipped and supported post BI 4.2 SP4, as will other add-ons. Please refer to workflows J and L.
Thank you so much for the detailed information and for the new blog post. This is really helpful and encouraging. The fact that there is a direct upgrade path for Lumira 2.x from Design Studio Add-On 1.x, and the compatibility with SP4+ (we’ve noticed your warnings about certain limitations – hopefully temporary), really mean a clear straight forward path, which makes upgrades easier. Great work, Matthew. I hope others will find it useful too. To avoid confusion, are you saying that at present there is no version of Lumira Server that works with SP4, whether installed before upgrade, after upgrade, or after a new installation? Lumira 1.31.6 (due soon) and 2.0 SP2 (GA version due in ~July, not the BETA) will work with BI 4.2 SP4. We’re currently investigating a potential problem with Lumira 1.31.x with BI 4.2 SP4 – it seems there’s a problem. Since we met couple of weeks ago you know my position regarding this. And this document has just reinforced it. People reading this who have done an inplace upgrade. Did it go well? Would you recommend it? Once again a great post from you side! Much appreciated. I’ve tried to install the 4.2 SP04 compatible versions of AO (2.4 SP03) and Design Studio (1.6 SP05) but I still receives and assertion error when running the installer ?? I’ve create tickets regarding the issue, just wanted to hear whether or not you have experienced the same behavior ? We are using BO 4.2 Support Pack 3 Patch 5. Please advise us on this. I’ve then upgraded BI4.2 to SP4 (update package). I haven’t seen or read your blog before I updated to SP4. Upgrading Lumira Desktop to 1.31.6 works without problems. The update for Lumira BI Addon 1.31.6 doesn’t work because of the mentioned issues (Cms can not be found, INS00013 error). None of the possible solutions seem to work. I also can not uninstall the current version 1.13.3. The setup.exe is visible in the background but after a couple of minutes the setup quits with an error. So, I can’t change my lumira BI-addon setup (no uninstall and no upgrade possible). Workflow J on your blog post suggests that my used upgrade scenario is supported… right? I haven’t updated Design Studio because I have to wait for a patch that’s officially supported with BI4.2 SP4. Now I have an environment where only the lumira BI-addon is not upgraded and Design Studio is not supported. But it seems everything is working. I can save a Design Studio Application to the BI Platform and Lumira documents can also be saved to the BI platform and can also be opened/refreshed in the BI Launchpad. How is this possible when you say these versions will not work with BI4.2 SP4? It is a test environment and I can always go back to my initial setup but will it be possible to upgrade the lumira bi-addon with newer patches in the future (once INS00013 error is fixed) or can I can just delete this test-environment? The update for Lumira BI Addon 1.31.6 doesn’t work because of the mentioned issues (Cms can not be found, INS00013 error). But it seems everything is working. I can save a Design Studio Application to the BI Platform and Lumira documents can also be saved to the BI platform and can also be opened/refreshed in the BI Launchpad. How is this possible when you say these versions will not work with BI4.2 SP4? Not all workflows in Design Studio and Lumira are broken when it comes to using an unsupported version. The problematic areas for Design Studio are consuming a managed connection (to any data source) and I’m unsure of the problematic areas for Lumira but I think they are related to Lumira Desktop connecting to the BI Platform for consuming a managed connection. I’m guessing here, but I think your problem is somehow related to your (copied?) test environment, perhaps your clients (or the installer) aren’t connecting to your (copied?) test environment, but the original cluster in some way. It clearly needs more investigation, but I’m not aware of anyone else with this issue, so it looks ‘environmental’….I think you should investigate further and then log a support incident with my colleagues in Product Support. We patched from 4.2 SP02 to 4.2 SP04 on a Single-Node Windows deployment. The new CONNECTION for “BI on BI” was not added – and the sample BIAR is not in the install-directory..
Is something “missing” from the Upgrade Package..? Is there an alternate place that we can download the just the “BI on BI” samples and the connections..? Is there actually a GA date for Lumira 2.0?? In particular a version which would work with BI4.2 SP4? Excellent presentation. In the past it was good practice to remove any patch from the server before upgrading it. I do not see this in this excellent post. We are currently on BO 4.1 SP6 patch 14. Would you recommend to uninstall patch 14 before running the upgrading to 4.2 SP4? It would free up disk space, but also cause extra work and risk of the server becoming crippled. We have no add-ons on the system. Installed the GA LSBIP 2.0 SP02 version on top of BIP 4.2 SP04 PL02 and having an interesting issue. The Lumira App acts like it’s loading and eventually times out. Same thing occurs when opening a Lumira 2.0 document. I’ll have to do a trace on Lumira Server and see what it shows but curious if anyone seeing this had encountered the same scenario. I even did a clean install on a sandbox and same behavior. Odds are I’m headed for a support ticket but thought I would post here and see what community input I get as well. Distrubuted Environment with all components installled on both nodes; then sized and scaled afterwards to have one primary node and one for primarily for Lumira Server 2.0 plus minimal use of Explorer. Design Studio 1.6 SP05 PL02 present when updated; was not uninstalled as recommended; On the system where I did a fresh install and see same behavior, a full install of LSBIP 2.0 SP02 was done. Lumira Server BIP 2.0 SP02 update package applied to LSBIP 1.31.5. On the system where I did a fresh install and see same behavior, a full install of LSBIP 2.0 SP02 was done. Also, not sure it’s relevant but just in case, the Galigeo extension for Lumira 1.31.x was present prior to the update. PS – whats up with the Lumira Server Properties XLF file in with the default properties files in the BOE webapps folder? Just curious. Seems there’s a problem with the old Design Studio 1.6.x applications running on Lumira 2 when also on BI 4.2 SP2. Patch 4 (for BI 4.2 SP2) should address this. I’ll update this comment with a KBA/Node number when I get one. We are planning to updated from 4.1 sp 5 patch 3 to 4.2 sp 3 patch 9. We need to increase the server capacity and would like to know the best path? Do we have to install the new servers on 4.1 sp5 patch 3 and then upgrade them or do we install 4.2 on the servers and move the content? In case the path is to move the content which tool do we use? Can I point you to https://blogs.sap.com/2013/11/05/doing-a-full-install-for-updating-from-bi40-to-bi41-think-again/ where this is discussed in depth ? In short, I strongly recommend you update and NOT install a fresh repository and somehow migrate content out of the old into the new. Rather, expand your existing cluster (with your new hardware using the same product version 4.1sp5p3), remove the nodes (you’ll no longer use) and then update your cluster to your target version using the rules I mentioned in this blog. (you could also remove the nodes after you’ve done your update). We are told that the installer in 4.1 is very different from 4.2 and that could cause some errors in the future if we wants to patch or update the system with that in mind they recommend a clean installation. Have you heard about that problem? I would not recommend a clean installation for that reason. We don’t recommend it because there’s no easy way to move content from one repository into another (new) one. Whilst you can use LCMCLI to copy content, you still need to setup many things in the target system from authentication, servers, license keys, and other stuff that can’t be promoted. You also won’t be able to use your Version Management Content that you’ve previously checked-in. We are strongly recommending that you do an in-place update. Thanks for the information, Matt, it is very useful. A question on Explorer, though – you say that it’s not affected by the upgraded compiler, but does it have to be re-installed after upgrading from BI4.1 to BI4.2 SP04? Hello Joe, Thanks for your feedback. When you update your version of SAP BusinessObjects Explorer, you must ensure that the Business Intelligence platform (BIP) version is updated to the required version before updating to the same version for SAP BusinessObjects Explorer. So, once you’ve updated to BI 4.2 SP4, you’ll need to install the Explorer 4.2 SP4. Do not uninstall the old Explorer Add-on. Its very much best left alone! Got it. Thanks for the quick reply! Lumira 1.31.6 based on HANA/BW/Unx and Design Studio based on HANA/BW to be upgraded from BI4.1 to BI4.2 SP5 (if possible). I believe Upgrade Management tool would be able to suffice it; but I’m sure you must be having some pointers on these. Could you please share those with me ? The Upgrade Management Tool is for when you are updating from XI3 to BI4. There’s no use for the Upgrade Management Tool once you’ve already updated to BI 4. Yes you are correct its for platform XI 3 to 4 where UMT is usefull. Any blogs/suggestions will help me. Thanks for all the useful information shared. We are planning to update from 4.2 SP03 Patch 05 to 4.2 SP05 Patch 04, we have Add-ons as Lumira 1.31.4 Design Studio 1.6 SP06 and SBOP Explorer 4.2 SP03, so based on all your statements and comments there shouldn’t be a concern perfroming the correct wokflow, in our case update required Add-Ons first without Explorer and then the BI platform and Explorer at the end. Now, my concern comes from KBA “2485676 – Assertion failed error when attempting to uninstall previous Support Pack update or Patch post upgrade to BI 4.2 SP4 or BI 4.1 SP10″ that mentions due the new compiler version is not possible to uninstall previous(old) software versions(patches and Add-Ons) on Windows as you have mentioned in your blog, now my doubt is, does it will be the same behavior if in a future we attempt to execute “Modify/Repair” option for our software installed, since as you know by now(4.2 SP03) when any modification or repair to the software is needed must be done selecting base software installation, currently BI 4.2 SP03. So can you confirm if this option will still be working or we have to worry about it if we proceed with the update? Thanks Matthew, that clears my doubt, appreciated. I am upgrading from BI 4.2 SP3 to BI 4.2 SP6 and We have SAP Lumira Server 2.1 SP0. Query : From the PAM it suggests that Lumira Server 2.1 SP0 is not supported on BI 4.2 SP6 so in that case do i also need to upgrade the Lumira Server 2.1 to SP1 immediate after BI platform upgrade . If yes than my dashboard that are developed using Lumira Discovery 2.1 SP0 , will they work after the upgrade. IF yes i am all good but if no than what should be my upgrade path.